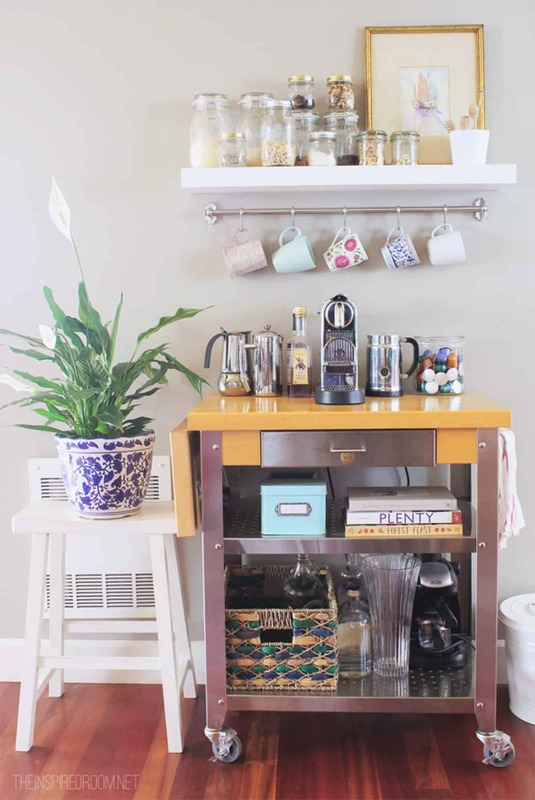 A coffee station is an important house feature for all caffeine addicts. 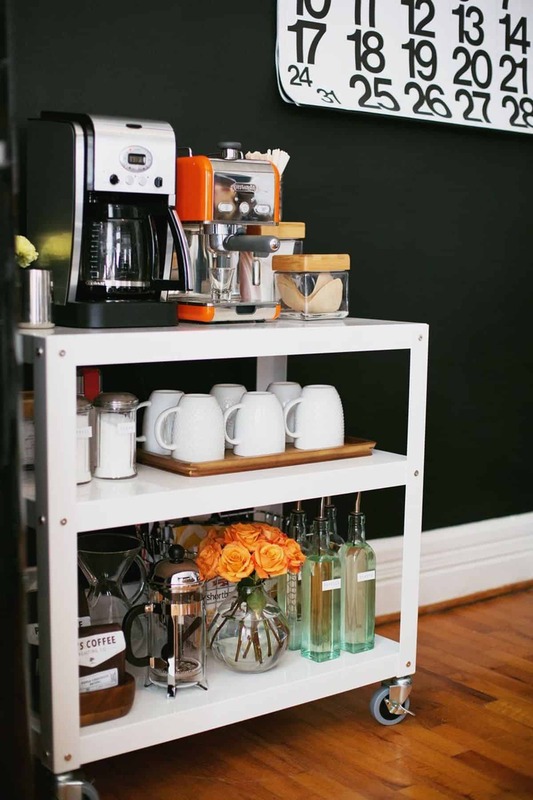 Modern coffee station ideas not just consist of a simple table with coffee pot and cup. They reflect the owner’s personality and emphasize the house interior design. 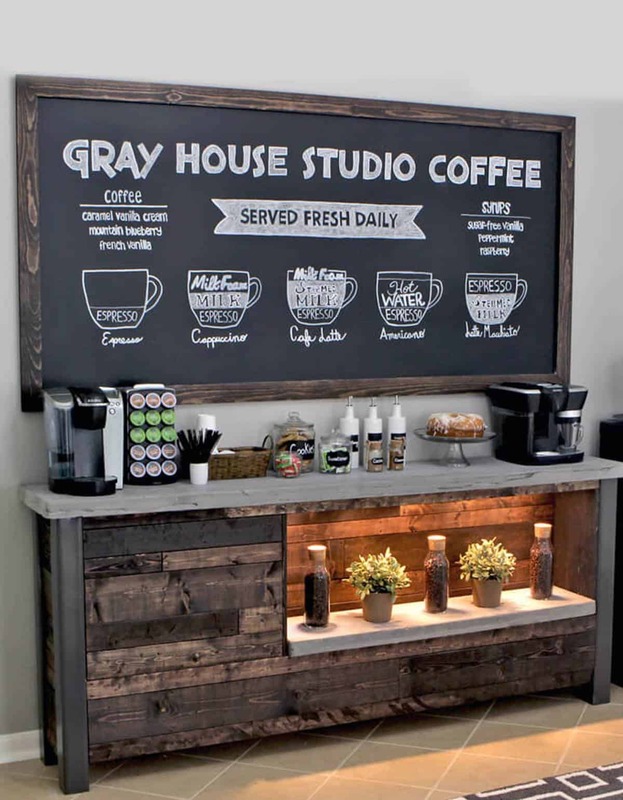 Unsure about how to make a memorable coffee station? These 20 ideas are good starts. 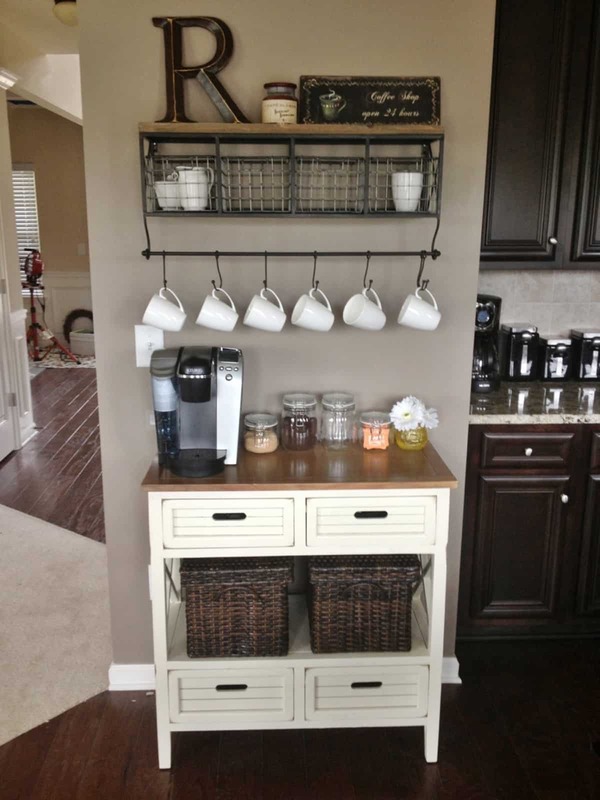 This DIY coffee station consists of a cabinet and wall rack. The simple set-up became more interesting with laundry baskets, metal bar with hooks (to hang cups), and floating shelf with a wire rack. A giant letter (such as the initial of your name) adds personal element. A coffee station usually puts emphasis on the coffee products and machine. However, this station makes the wall shelf as the main feature. The blue shelf has great contrast with the white wall. 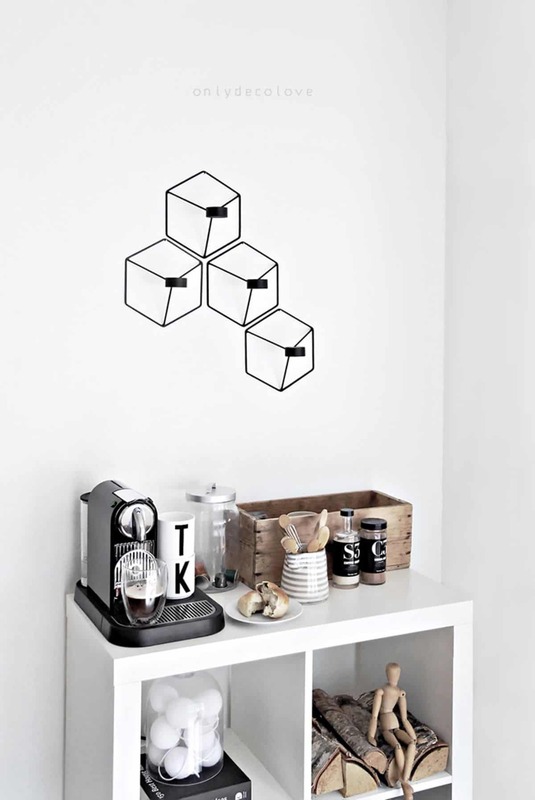 The cup hooks turn simple white cups into decorative elements. Love colors in your caffeine station? Try artsy and colorful coffee bar ideas. This one has a wall full of colorful artworks above it. 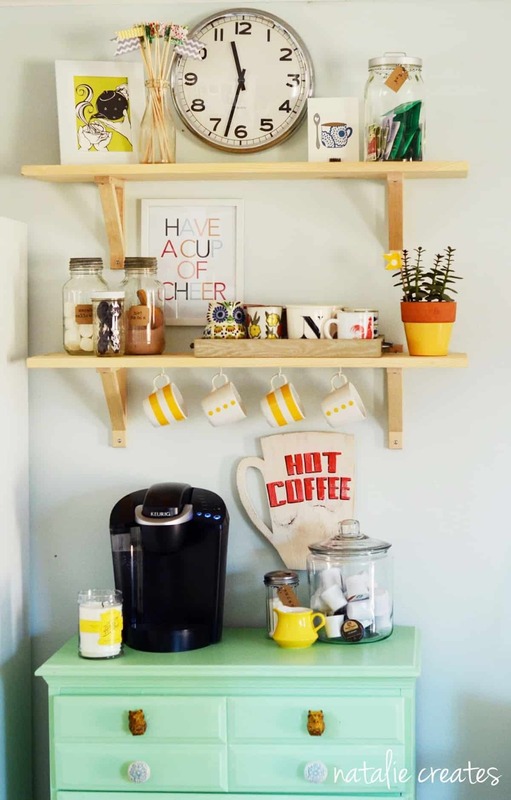 A mug tree becomes a perfect place to hang colorful porcelain mugs. The colors create a unique look in an otherwise simple white cabinet. This coffee station cabinet was installed to match a wall corner. The white cabinet has a black mirrored countertop, creating a sleek appearance. 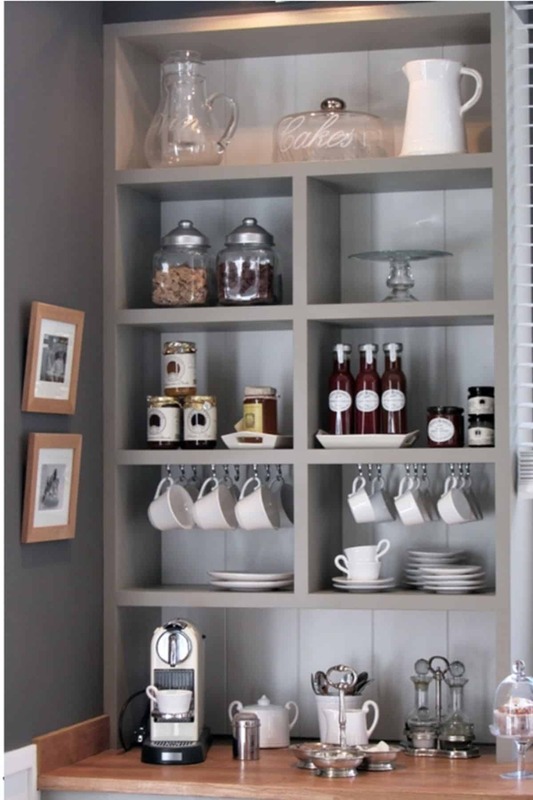 The grey walls have wooden shelves and café-style wall texts, making your cabinet looks like a part of the coffee shop. 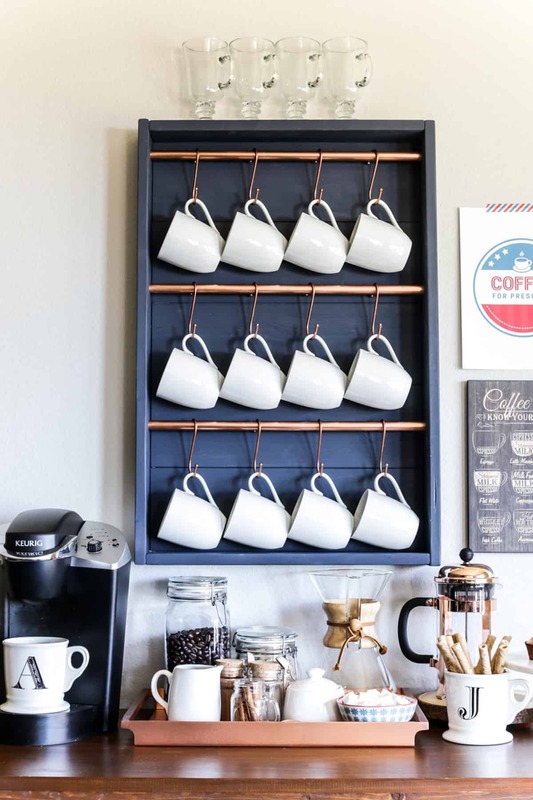 Make your office coffee station less boring with a smarter arrangement. This white cart has two coffee machines, one of them has a bright orange color. The middle part is dedicated to white cups. The bottom is a special place for press and coffee supplies. Orange flower and calendar perfectly support the office atmosphere. This coffee bar has a bright, yellow-dominated tone to lift your spirit. The yellow tone appears in sugar label, milk jug, cups, pot, and artwork. 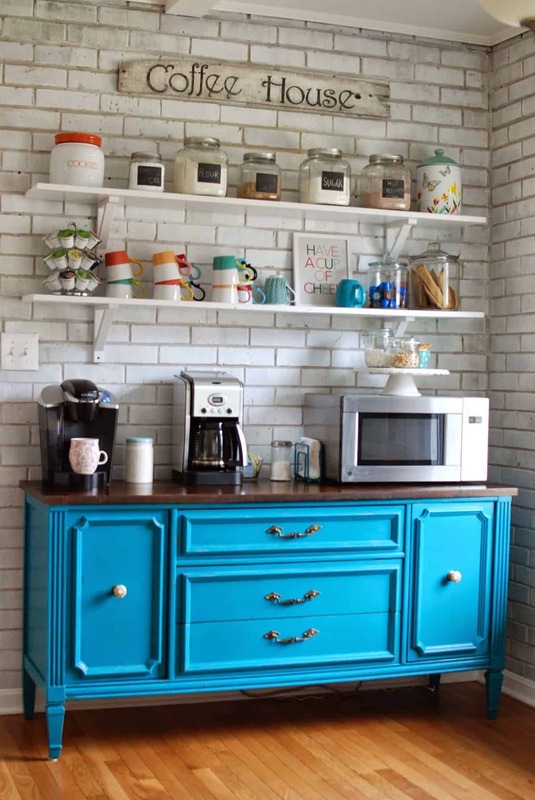 A turquoise cabinet is a great base for a sleek, black coffee machine. Several coffee-related decorations emphasize the function. This white coffee bar has rich textures and shapes from its vintage decoration. The cabinet has a wavy accent, and the lamp’s woven shade creates a unique look. The chalkboard decoration and mini pine tree reflect holiday cheer. 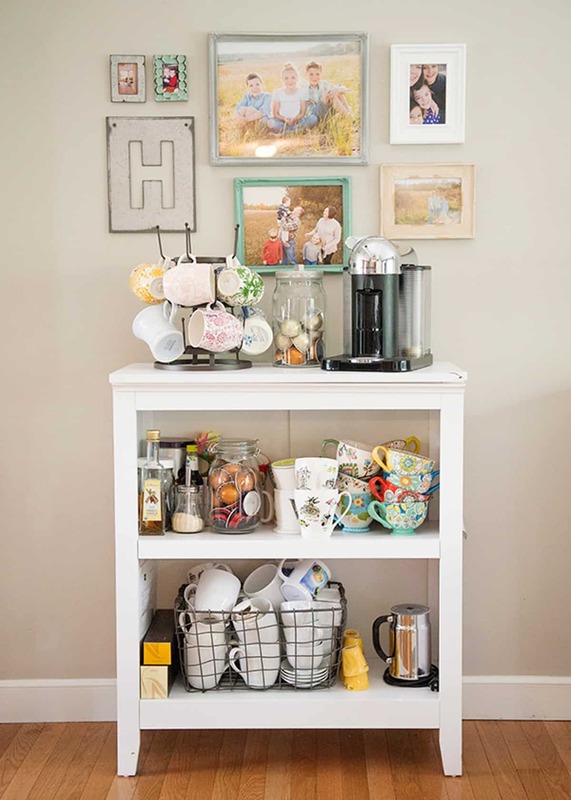 This coffee station emphasizes the personal and family life of the owner. Family pictures and cute artworks look great together above a simple white cabinet. Colorful porcelain mugs, cups, pots, and coffee supplies create a slightly messy but cheerful appearance. This mini coffee station uses an empty space in an awkward corner. It is a nice distraction to refresh mind before entering the main “battleground” at the workplace. 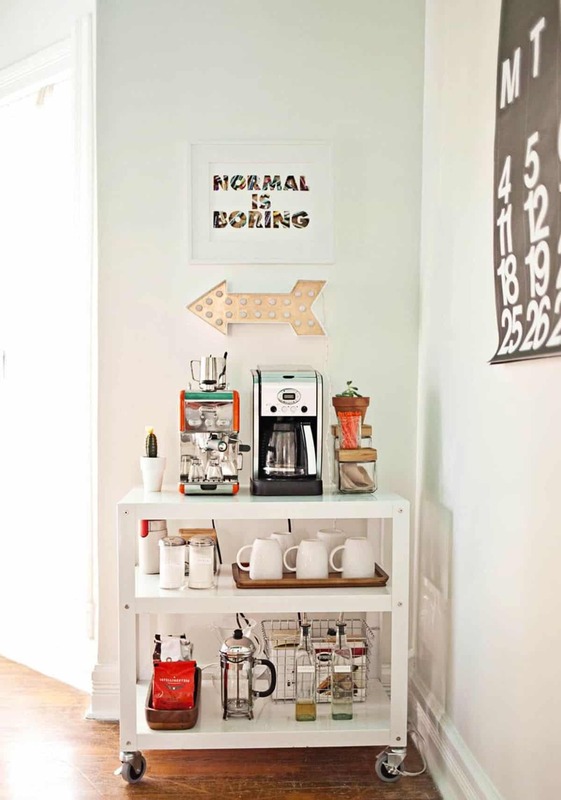 Funny sign, playful arrow, coffee machine, and elegant white cups make this coffee station more enticing. 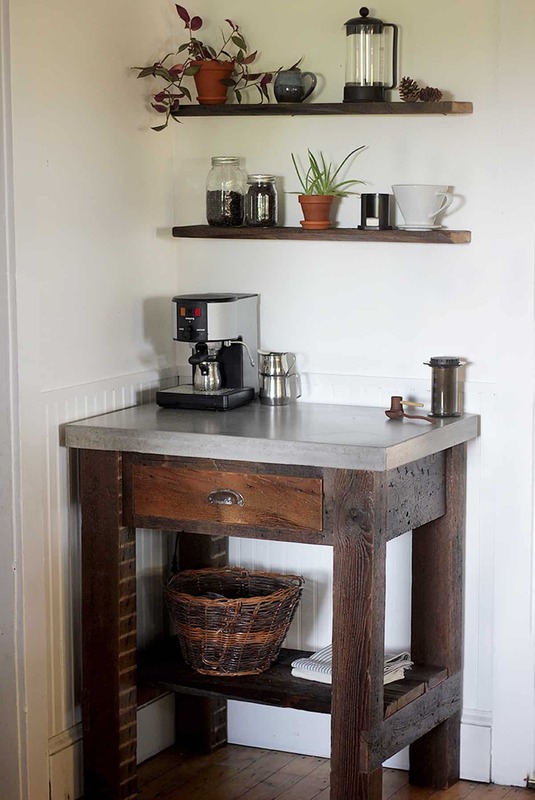 This kitchen coffee station makes use of the room’s rustic design. The bright blue cabinet creates a great contrast with white subway tiles and wooden floor. 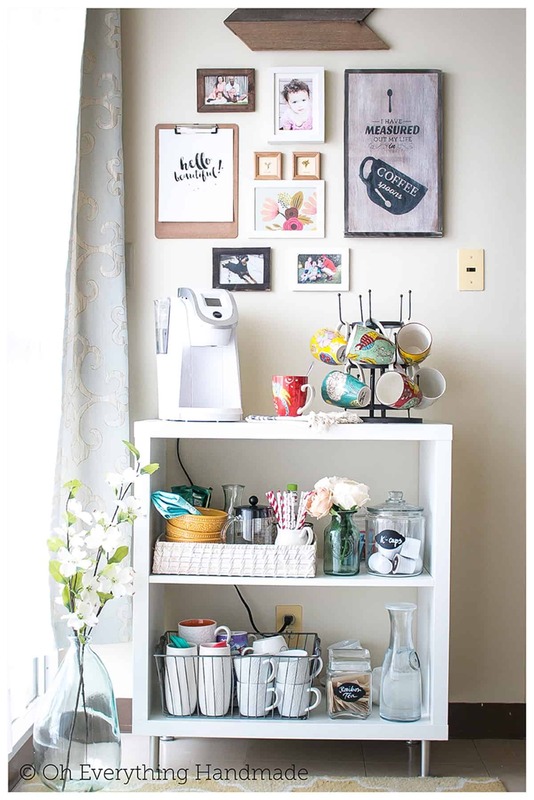 Floating white shelves become a nice place to store cups, coffee supplies, and sugar. The countertop is dedicated to coffee machines and microwave. This coffee bar cabinet was made of recycled wood. The dark, grainy look adds character to the overall look. Bottles filled with coffee beans were arranged with mini potted plants. 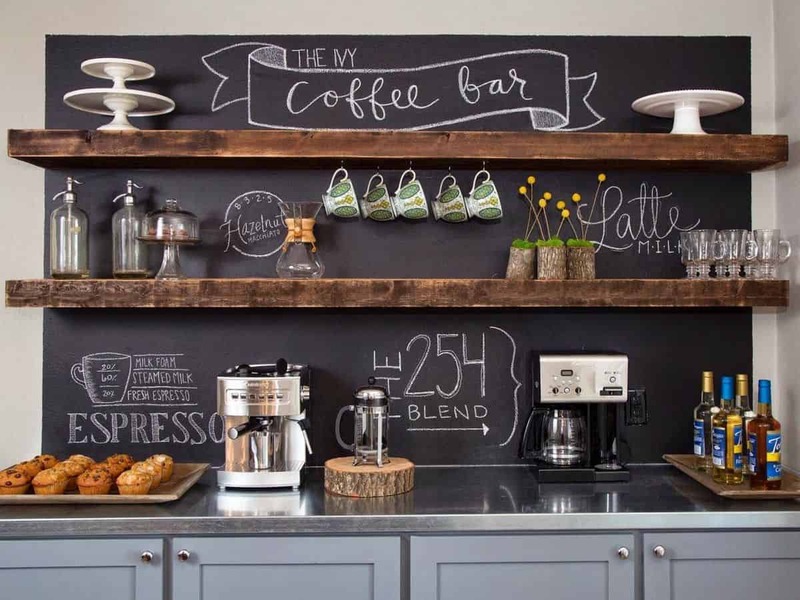 A chalkboard decoration reflects the inside of a casual coffee shop. 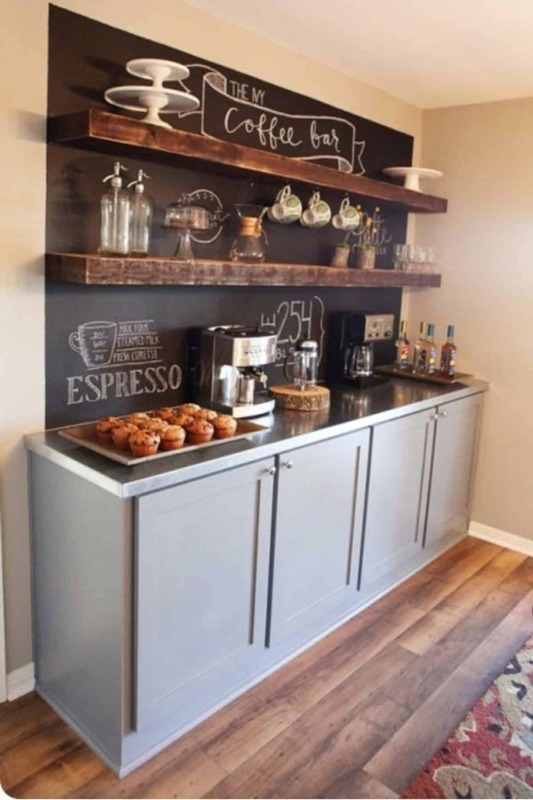 This coffee-and-muffin station provides a nice breakfast corner. The muffin tray looks great being side-by-side with the coffee machine. 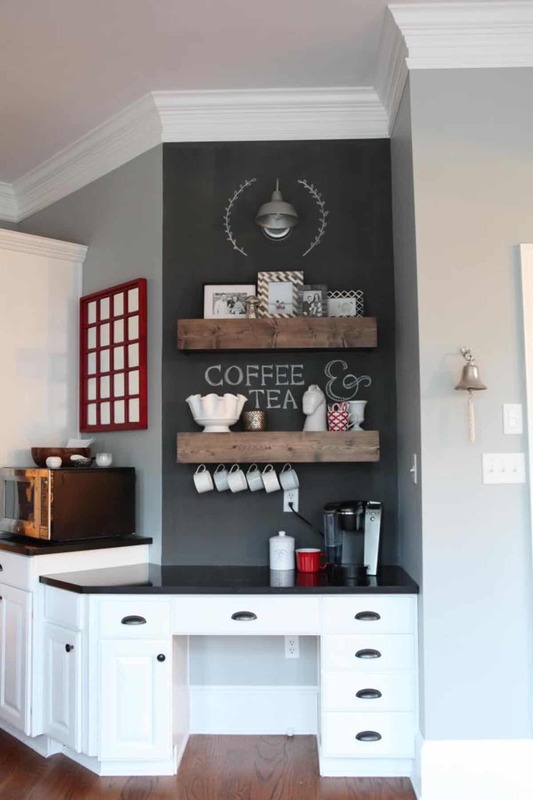 Floating shelves and chalkboard art make the coffee station more interesting. You can apply this at home, office, or outside a conference room. This Nespresso station combines white, black, and wood color in a modern coffee bar. A rustic wooden box, wooden figure, and minimalistic wall ornament make the station more beautiful. Perfect for coffee lovers who love practicality. This stylish coffee bar furniture has a bright but light appearance. The wooden frames look perfect when paired with blue coffee maker, bird ornament, and brass pot with cups. 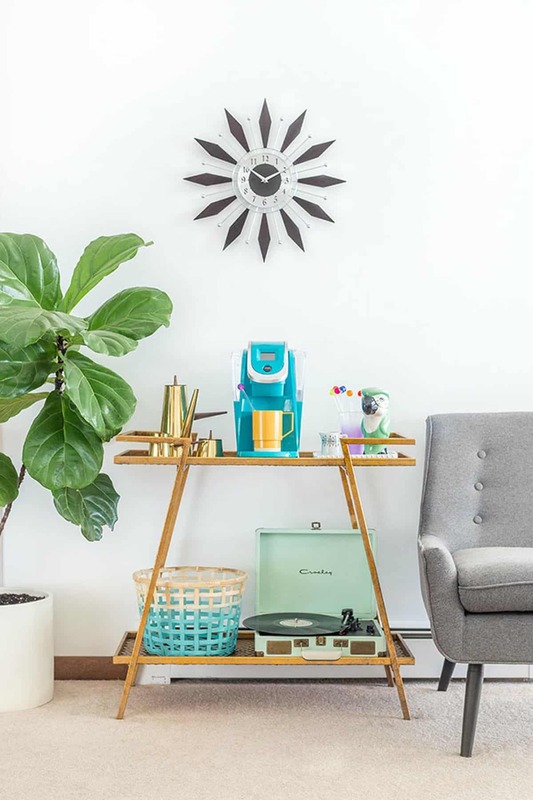 An old record player and ornamental clock make the coffee bar look more special. 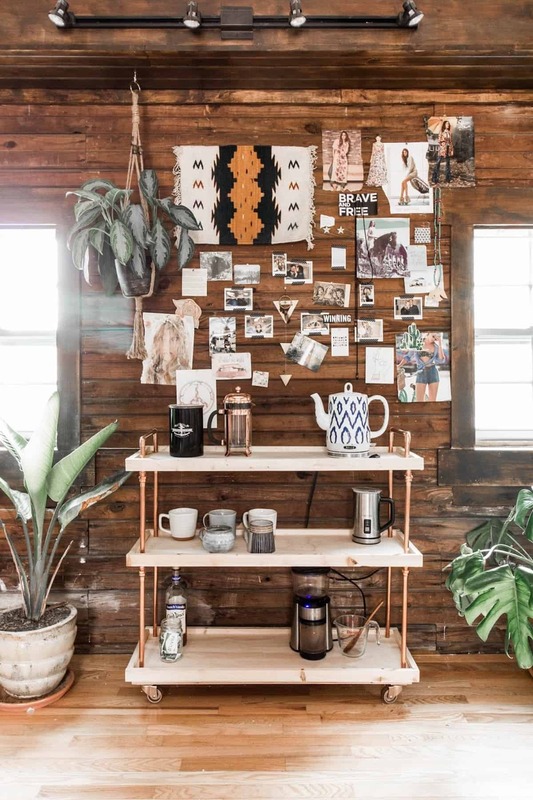 Copper bars add a more unique touch in a regular coffee cart. You can make it yourself with light-colored wooden panels. The overall look is classic, light, and with a slight touch of modernity. Perfect to add personality at home or in the office. This grey coffee organizer is a dream of all caffeine lovers who like neat things. Each section has a similar look and size. 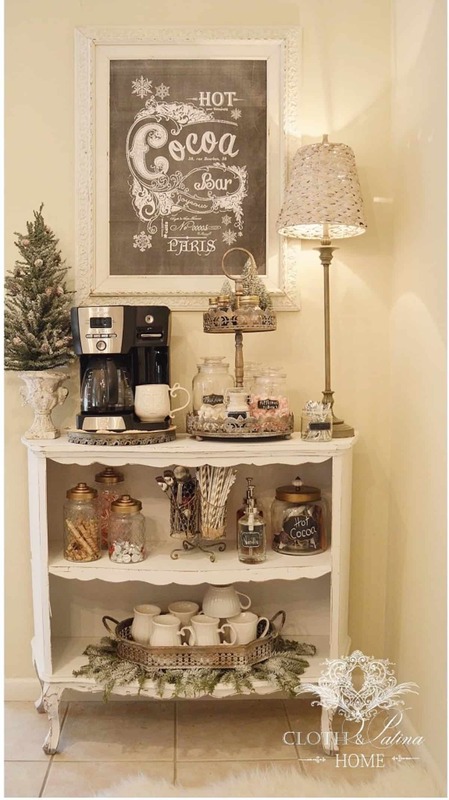 This organizer cabinet is perfect if you have numerous coffee supplies that you want to showcase and arrange. This corner bar table looks common, until you realize that the top was made of concrete. The dark, recycled wood provides a homey, rustic look. However, the concrete top adds a stronger personality. Floating shelves give additional storage space, along with several potted plants. 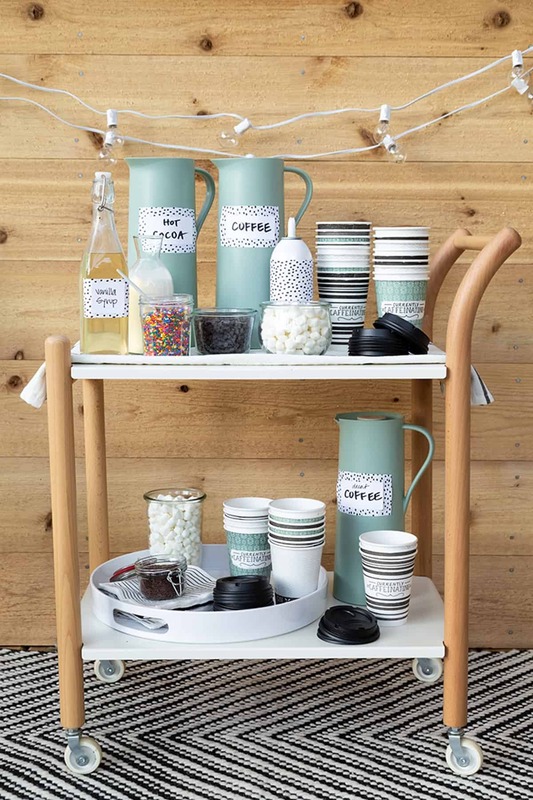 Make coffee bar more interesting with this updated coffee cart. The unique color combination makes the cart a perfect companion for minimalistic furniture. It looks great with white shelf and stool. A potted plant and cup hooks add interesting elements in the bar. This cart has thick wooden frames and white panels, perfect to create a slightly whimsical look. The cart showcases not only coffee, but also chocolate drink. You can put this cart indoor or outdoor to give people more options in drinking. Combine dramatic shades in a coffee bar that combines black, white, and brass. 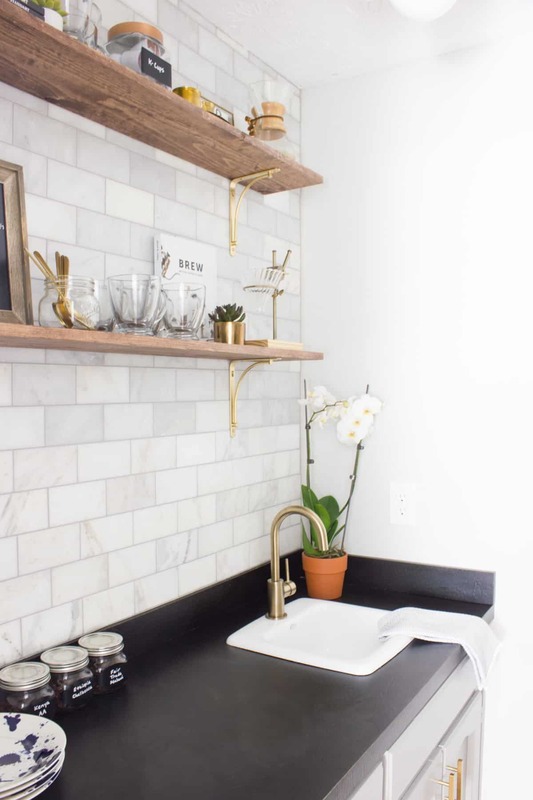 The brass fixtures look luxurious, black countertop dramatic, and white walls comforting. This design is perfect for modern kitchen owners who like accessibility. These coffee station ideas are modern, but with unique twists in their designs. Make your daily coffee sessions more fun with these stations.